There are 12 Assisted Living Facilities in the Fredericksburg area, with 11 in Fredericksburg and 1 nearby. The average cost of assisted living in Fredericksburg is $3,879 per month. This is higher than the national median of $3,346. Cheaper nearby regions include Stafford with an average starting cost of $3,417. To help you with your search, browse the 137 reviews below for assisted living facilities in Fredericksburg. On average, consumers rate assisted living in Fredericksburg 4.4 out of 5 stars. Better rated regions include Culpeper with an average rating of 4.9 out of 5 stars. Caring.com has helped 26 families in Fredericksburg find high-quality senior care. To speak with one of our Family Advisors about assisted living options and costs in Fredericksburg, call (855) 863-8283. Fredericksburg, Virginia, is a town steeped in history. It's home to four major battlefields and has connections to both colonial times and the Civil War. History buffs may enjoy Spotsylvania National Military Park and the Fredericksburg National Cemetery, where thousands of Union soldiers are buried. Fredericksburg has more to offer seniors, including 13 assisted living facilities. 11 of these are located within Fredericksburg, and the other two are in neighboring towns. All these facilities are regulated by Virginia's Department of Social Services. The cost of living in Fredericksburg is 23 percent higher than the national average and 15 percent higher than the Virginia average. Seniors living in the area may find that everyday goods and services are more expensive here than in other cities. The crime rate in Fredericksburg is 40 percent higher than the national average. Seniors and other residents have a one in 26 chance of becoming a victim of either a property crime or violent crime. The Fredericksburg area is home to world-class medical facilities, including Mary Washington Hospital, in the event of medical emergencies or illness. The weather in Fredericksburg is fairly stable in terms of temperature. The fall and winter months see highs ranging in the mild 40s, while the summer months usually hover around the mid-80s to the low 90s. There is a high amount of monthly precipitation, however, so seniors may find it difficult to spend much time outdoors. The air quality in Fredericksburg is 1 percent better than the national average, with a pollution index that is 87 percent better than the country's median. This means that seniors with lung conditions will have clean air to breathe for much of the year. Fredericksburg offers seniors many transportation options, including a Mobility Options program that can help them get to medical appointments, shopping and other locations. Assisted Living costs in Fredericksburg start around $3,879 per month on average, while the nationwide average cost of assisted living is $4,000 per month, according to the latest figures from Genworth’s Cost of Care Survey. 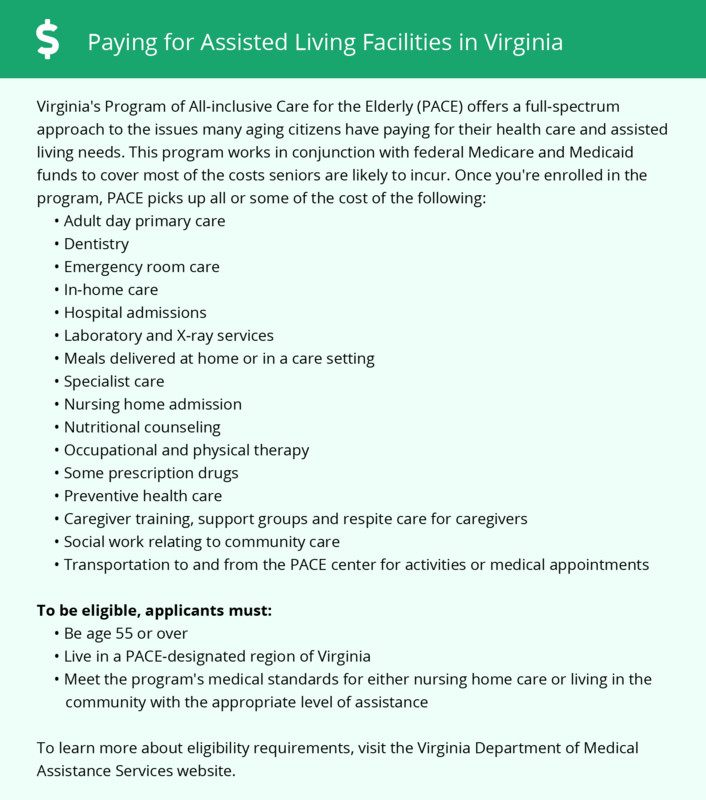 Eligible seniors can apply for financial assistance for assisted living in Virginia through the Auxiliary Grant and a state supplement to SSI. To see a list of free assisted living resources in Fredericksburg, please visit our Assisted Living in Virginia page. Fredericksburg-area assisted living communities must adhere to the comprehensive set of state laws and regulations that all assisted living communities in Virginia are required to follow. Visit our Assisted Living in Virginia page for more information about these laws.